Very inspiring story. The world would become truly rich when everyone can have a decent life. To make the poor as capitalist is the best way to go about it. More people should emulate Hal Taussig if the world is to be come equitable, peaceful and a heaven to live in. Pam: It seems that Mr. Taussig and his wife a wonderful people. I wish I lived in his state, I need help. I have struggled all my life, tried to create a business, but for some reason doors close. I only have God to believe in, and I’m doing the best I can. I have done everything from create products, to try to start a used car business, to try to get my education, to listen to JD jakes everyday. For some reason, God does not want me to be happy, I guess. And I guess that suppose to be ok. I guess, what can I do? Thank you for emailing this story, It made me write this. I feel alittle better. Have a wonderful day. What a lovely, inspiring man. Simple Living, High Thinking! Yet another Mahatma!! What a wonderful life!!! I enjoyed every word of Hal Taussig’s life as narrated in your mail. 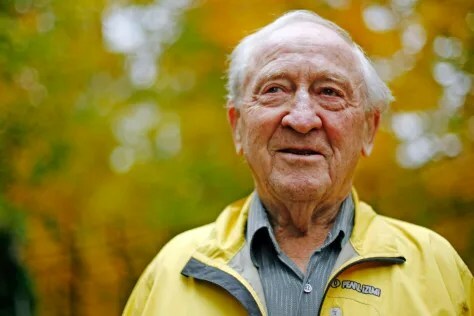 Every one of us living a decent life owes a lot to the sacrifice made by generations of people in the past – our parents, teachers, friends and well-wishers – like Hal Taussig. I think we should remember with gratitude our gifts from the Universe made possible through noble souls like Hal Taussig. But, I desire to know what prompted Hal Taussig to be what he is, apart from his initial failure. How did this transformation in outlook to life and possessions take place? What a wonderful story! A Mahatma or a social entrepreneur or both? Loved reading every word of the mail. I am of the view that we enjoy the gifts of the Universe (Field of Potentiality, FP) through the joyful sacrifices of Hal Taussig and people like him over generations. I also consider it my duty to remember with gratitude their gifts to the world. I am curious to know the event(s) that triggered the change in the mental outlook of Hal Taussig to altruism, sacrifice and possibly detachment, apart from his initial setback with cattle business. Shall be thankful, Pam, for sharing anything that will be further enlightening. What a remarkably inspirational individual. I am also reminded, however, of a passage in A Course In Miracles that says not to teach poverty by joining the poor. They are poor because they have invested wrongly. If you truly believe it’s an abundant universe, then not-having is a false idea only needing to be overcome. And having is itself no sin. But how one approaches material wealth makes all the difference. An aversion to having can be just as powerful a pitfall as desire. What an amazingly awesome tale of someone who really does walk the talk about helping others while not taking more for himself. Living a simple life, quite simply, makes for a joyful and prosperous life. May more of us find this type of joy in our lives. I know I’ll be checking out Untours for my future travel plans as that is how we like to travel! Hal Taussig is seems like warren buffet.it was right that money never brings happiness.but it diminish our inner happiness. perfect but 100% profit ? really. we need big heart to donate such amount of profit for good cause. What a wonderful and inspiring story, Pam. Thank you for sharing it with us. Thank you for sharing this. I’m going to share it with my daughter who still has the ability to travel and this is right up her ally. Money doesn’t make you happy.